Built with Pratt style trusses some fifty years after their invention in the 1840's by Thomas and Caleb Pratt, the bridge is 238 feet long. 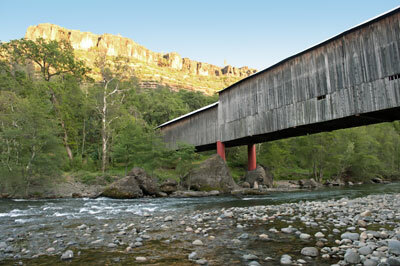 It is unique due to its three unequal spans (30 feet and 128 feet and 80 feet), and because the center bridge housing is higher than that of its two sides. 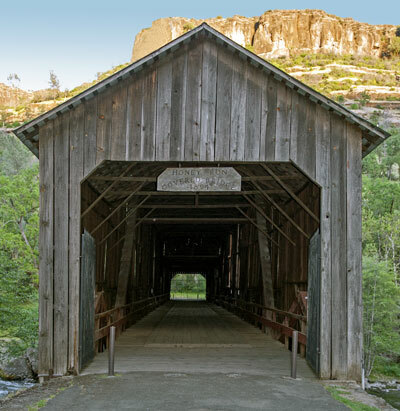 The Honey Run Covered Bridge is the only bridge in the United States with three unequal sections, and it is one of eleven covered bridges still standing in California. Source: Excerpted from the NRHP nomination submitted in 1988.